A Victorian building company has been issued a one-month exclusion sanction for its failure to comply with state security of payments legislation. The exclusion sanction, imposed by the Minister for Jobs and Industrial Relations, Kelly O’Dwyer, means APM Group (Aust) Pty Ltd (APM) and its related entity APM Holdings (Aust) Pty Ltd are excluded from expressing interest in, tendering for, or being awarded Commonwealth-funded building work for the one-month exclusion period, 1 May 2019 to 31 May 2019. $40,000, and failing to resolve a payment dispute with a subcontractor in a reasonable, timely and cooperative way. ABCC Commissioner Stephen McBurney said subcontractors deserved to be paid on time and that in many cases their livelihood depended upon it. “In this instance, APM’s conduct had a significant impact on the subcontractor both emotionally and financially,” Mr McBurney said. “APM’s failure to pay the subcontractor compromised the ability of the subcontractor to pay their bills and put pressure on their relationship with suppliers. There are a number of requirements placed on code covered entities that are intended to help ensure progress payments are made in a timely manner. Code covered entities must also report disputed or delayed progress payments to the ABCC. The APM sanction is the first exclusion sanction relating to non-compliance with security of payments laws since the ABCC launched its Security of Payment campaign in July 2018. If you’re currently negatively gearing the rules won’t change. If you want to use it on new homes, you still can. But we cannot have property investors playing with loaded dice against our young people, Generation Y and the Millennials. And instead of patronising millions of young Australians with lectures about cutting back on smashed avo. Why don’t we tell them the truth: Getting together a 20 per cent deposit – plus stamp duty – is so much, much harder than it was 20 or 25 years ago. And it’s even more difficult, when your government uses your taxpayer money to subsidise the property investors bidding against you. The intergenerational bias that the tax system has against young people must be called out. A government has to be brave enough and decent enough to stop the bias against first home buyers and young Australians. And when everyone has an equal chance to fulfil their potential. This is why investing in the future, always begins with education. This will mean new facilities for training nurses in Caboolture and Devonport. New workshops in Midland and Bellevue, to make sure the METRONET train carriages work goes to apprentices. A new construction centre for tradies in Chadstone and Frankston. And so much more. Labor will also pay the upfront fees for 100,000 TAFE places to get more Australians training in high-priority courses. Targeting Negative Gearing to new housing. Renovating the national energy grid with new pipelines, interconnectors, hydro and storage. Launching the biggest affordable housing program since the Second World War – building a quarter of a million new homes. And Phase 2 of the ACT light rail. And – thanks to Albo’s hard work – the work is just beginning. Labor will continue to develop and support the development Northern Australia: including overdue upgrades for the beef roads and the Rocky ring road. And tonight I can announce we will deliver $1.5 billion to upgrade the Gateway Motorway from Bracken Ridge to the Pine River – and the next stage of the Bruce Highway from the Northern Suburbs to Caboolture. There’s another big difference between Liberal and Labor on infrastructure. In their budget you have to vote for the current Prime Minister at this election… … then you have to vote for whoever is their leader at the next election… …and that’s before anyone even digs a hole. Our projects are not on the never-never, they are locked in to our first budget. There’s another difference that I offer the Australian people, frustrated by the constant short- termism in the infrastructure debate. If we are elected, I will invite the then-Opposition Leader to be involved in nominating directors to Infrastructure Australia, so we take the politics out and we make generational decisions in infrastructure for once and for all time. And every time we invest Commonwealth dollars in infrastructure projects. …a Labor Government can repair the damage done. Tonight, I say we will help train 150,000 apprentices for the jobs of the future. We will provide additional support for businesses which take them on – both young people and mature age workers looking to re-train and to learn new skills. And we’ll create an Apprentice Advocate – because the tragic death of an 18 year old apprentice on the Macquarie Park site last week, reminds us that we’ve got to protect our apprentices and they have the same right to come home safe as everybody else. Only Labor has a concrete, practical plan to get wages moving again. Our Tradie Pay Guarantee means that subbies working on Commonwealth projects get paid on time, every time. View the Labelling of ACP products discussion paper (PDF). QBCC Commissioner Brett Bassett said the first deadline for new reporting reforms was at midnight on 31 March 2019. “Under the laws which came into effect on 1 January this year, all QBCC licensees with a turnover of more than $30 million must submit their audited financial reports for the 2017/18 financial year to the regulator by the end of March,”Mr Bassett said. “By the end of 2019, every other licensee will be required to meet new financial reporting rules. “These new requirements help the QBCC to monitor the viability of licensees. Viable construction companies offerbetter stability for the industry and improve the security of payment for subbies and suppliers. The Commissioner said that of the 855 licensees in categories 4 to 7, who have an annual revenue of more than $30 million, the QBCC had so far only received financial reports from 171 licensees. Many of these licensees are large multi-national companies operating across the country. “Earlier this month we suspended the licence of construction giant Laing O’Rourke Australia Construction Pty Ltd forfailing to meet minimum financial requirements,” Mr Bassett said. “Let me be clear – if you are operating outside of the law, we will take appropriate regulatory action. “Part of our job is to ensure Queensland’s building and construction industry is safe, stable and sustainable, and if big companies are operating with unacceptable financial risk, then we will be taking regulatory action. “We must work to protect the sector from serious financial harm. When big companies collapse, it has a devastating impact on the industry. For instructions on how to submit the financial documents, visit www.qbcc.qld.gov.au/financial-reporting-licensees. The QBCC website also has a licensee search function for consumers. The Australian Construction Industry Forum (ACIF) has welcomed the implementation plan for the recommendations of the Shergold Weir report released yesterday. ACIF commends the Building Ministers’ Forum (BMF) and the Federal, State and Territory Governments for the release of the implementation plan, albeit 13 months after the release of the Shergold Weir Report in February last year. “ACIF would like the recommendations implemented by May 2021, as recommended in the Shergold Weir Report” Mr Cameron added. “ACIF and its member organisations are keen to assist the Building Ministers’ Forum and Federal and State Governments to implement the recommendations of the Shergold Weir Report by May 2021, and stand ready to discuss means to achieve this”, Mr Cameron stated. 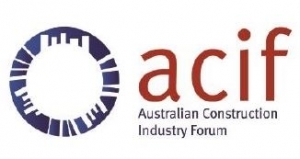 Australian Construction Industry Forum (ACIF) is the cohesive, trusted voice of the Australian Construction Industry. ACIF facilitates and supports an active dialogue between the key players in residential and non-residential building, and engineering construction, other industry groups, and government agencies. ACIF’s focus is on innovation, collaboration, equity and sustainability for the industry. ACIF Members are the most significant Associations in the industry, spanning the entire asset creation process from feasibility through design, cost planning, construction and building and management. ACIF harnesses the resources of its Members to research and develop initiatives that benefit businesses of all sizes, from the largest of construction companies to small consultancies. More information on ACIF is available from www.acif.com.au. industry involvement in the process. Implementation of the reforms will evolve over time to respond to new, innovative approaches and emerging policy priorities. The BMF is committed to consistent and concerted effort over the next few years to devise and implement comprehensive solutions involving government and industry. As such, this plan will be regularly reviewed by the BMF, with updated reports from jurisdictions provided to the BMF at least annually, or sooner if required. Minister for Jobs and Industrial Relations and Minister for Women, the Hon Kelly O’Dwyer MP, announced on International Women’s Day funding of $675,000 for Women Building Australia, a construction industry led program to increase the participation of young women working in the sector. “The construction industry is Australia’s third largest industry and employs more than one million Australians,” Minister O’Dwyer said. Through a national mentoring program and a national career expo program Women Building Australia will promote, retain encourage and empower women to enter and remain in the building and construction industry. Today’s announcement follows a successful 12-month trial of the Women Building Australia program. The funding will be provided as part of the Coalition Government’s Women’s Leadership and Development Program. “Whilst there are more women in work than ever before, with women’s full time employment and the female participation rate reaching record highs last month, we want to see even more women active in the workforce, including in the building and construction industry,” Minister O’Dwyer concluded.